Dermira Announces “Life Unfolds” Direct-to-Consumer Campaign to Highlight QBREXZA™ (glycopyrronium) Cloth | Dermira, Inc.
MENLO PARK, Calif., March 25, 2019 (GLOBE NEWSWIRE) -- Dermira, Inc. (NASDAQ: DERM), a biopharmaceutical company dedicated to bringing biotech ingenuity to medical dermatology by delivering differentiated, new therapies to the millions of people living with chronic skin conditions, today announced the launch of “Life Unfolds,” a new direct-to-consumer creative campaign designed to generate awareness of QBREXZA™ (glycopyrronium) cloth as a potential treatment option for people living with primary axillary hyperhidrosis, commonly known as excessive underarm sweating. QBREXZA, the first and only, once-daily, topical prescription anticholinergic, is approved by the U.S. Food and Drug Administration (FDA) to treat adult and pediatric patients 9 years of age and older living with this chronic, medical skin condition. QBREXZA is a pre-moistened, medicated cloth that comes in individually wrapped packets. The multichannel campaign will launch with a direct-to-consumer television advertisement featuring QBREXZA patients and highlight uncomfortable situations that people living with the condition routinely experience. Additionally, the campaign will launch in national consumer print media outlets, across digital and social media platforms and in dermatologists’ offices across the United States. Visit www.Qbrexza.com to learn more about the treatment, including appropriate use and important safety information. The campaign supports Dermira’s commitment to educate patients about its therapies in a transparent and patient-focused manner. QBREXZA (pronounced kew brex’ zah) is an anticholinergic indicated for topical treatment of primary axillary hyperhidrosis in adult and pediatric patients 9 years of age and older. QBREXZA is applied directly to the skin and is designed to block sweat production by inhibiting sweat gland activation. For more information visit www.QBREXZA.com. To support, convenient and affordable access to our medicines, DermiraConnect is designed to offer financial assistance and other customized support services for eligible patients and healthcare professionals. For more information about DermiraConnect, visit www.dermiraconnect.com or call 1-877-DERMIRA. Dermira is a biopharmaceutical company dedicated to bringing biotech ingenuity to medical dermatology by delivering differentiated, new therapies to the millions of patients living with chronic skin conditions. Dermira is committed to understanding the needs of both patients and physicians and using its insight to identify, develop and commercialize leading-edge medical dermatology products. 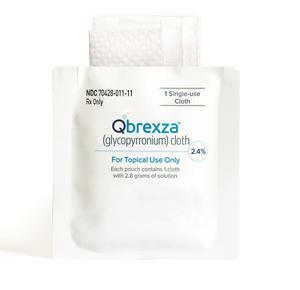 The company’s approved treatment, QBREXZA™ (glycopyrronium) cloth, is indicated for pediatric and adult patients (ages 9 and older) with primary axillary hyperhidrosis (excessive underarm sweating). Please see the QBREXZA prescribing information. Dermira is also evaluating lebrikizumab for the treatment of moderate-to-severe atopic dermatitis (a severe form of eczema) and plans to initiate a Phase 3 clinical development program by the end of 2019; and has early-stage research and development programs in other areas of dermatology. Dermira is headquartered in Menlo Park, Calif. For more information, please visit http://www.dermira.com. Follow Dermira on Twitter, LinkedIn and Instagram. The information in this news release contains forward-looking statements and information within the meaning of Section 27A of the Securities Act of 1933, as amended, and Section 21E of the Securities Exchange Act of 1934, as amended, which are subject to the “safe harbor” created by those sections. This news release contains forward-looking statements that involve substantial risks and uncertainties, including statements with respect to: Dermira’s goal of bringing biotech ingenuity to medical dermatology by delivering differentiated, new therapies to the millions of patients living with chronic skin conditions; Dermira’s plans and strategies relating to its direct-to-consumer campaign, including goals to generate awareness of QBREXZA™ (glycopyrronium) cloth as a potential treatment option for people living with primary axillary hyperhidrosis and to and encourage others who might be suffering from primary axillary hyperhidrosis to consider seeing a dermatologist to learn what impact the treatment may have on their lives; and the intended benefits of DermiraConnect of providing financial assistance and other customized support services for eligible patients and healthcare professionals. These statements deal with future events and involve known and unknown risks, uncertainties and other factors that may cause actual results, performance or achievements to be materially different from the information expressed or implied by these forward-looking statements. Factors that could cause actual results to differ materially include risks and uncertainties such as those relating to market acceptance of Dermira’s potential products; the impact of competitive products and therapies; Dermira’s ability to manage the growth and complexity of its organization; Dermira’s ability to maintain, protect and enhance its intellectual property; and Dermira’s ability to continue to stay in compliance with applicable laws and regulations. You should refer to the section entitled “Risk Factors” set forth in Dermira’s Annual Report on Form 10-K, Dermira’s Quarterly Reports on Form 10-Q and other filings Dermira makes with the SEC from time to time for a discussion of important factors that may cause actual results to differ materially from those expressed or implied by Dermira’s forward-looking statements. Furthermore, such forward-looking statements speak only as of the date of this news release. Dermira undertakes no obligation to publicly update any forward-looking statements or reasons why actual results might differ, whether as a result of new information, future events or otherwise, except as required by law. Kamudoni, et al., The impact of hyperhidrosis on patients’ daily life and quality of life: a qualitative investigation. Health and Quality of Life Outcomes, 15(1). 2017.